Hey folks! We hope you’re enjoying the new website theme. And it includes pretty pictures, yaay! The next GSM is coming up soon. We have TENTATIVELY scheduled it for February 7, 2015. As we are still pinning down schedules, this date is subject to change over the next couple of weeks, and if it does we will post the new date and time here. Since we have always gone over an hour on the private portion of the meeting, we will still start the private meeting at 9pm UTC, but plan on switching to public at 10:30 pm UTC (a half hour later). Just like any GSM, we will be reviewing cities for promotion to Senator and Governor. The cutoff date for your last promotion is January 10, 2015 – the date of the last GSM. If you applied for Senator or Governor for the last meeting but did not receive it, you have been rolled over and need not re-apply. Click here to request a promotion. The sooner you do it, the better! Remember that you don’t need to meet the requirements at the time of your application – you just need to meet them at the time of the meeting. So, if you’re at 33 builds but will be around between now and the meeting, go ahead and apply! Promotion to [Mayor] was on or before the cutoff date (January 10, 2015). No active warnings against you. 40 (or more) unique builds, with good effort put into them. At least 10 houses, apartments, shops, or office spaces are owned by other players – not the mayor or DM. A unique, identifying landmark within your city. Promotion to [Senator] was on or before the cutoff date (January 10, 2015). All Senator cities meet this requirement. 60 (or more) unique builds, with good effort put into them. This is the first meeting where cities are eligible for promotion to the Premier rank. However, because the requirements and perks are still largely undecided, we will NOT be reviewing cities for promotion to Premier at this meeting. We will be accepting Premier requests in the near future – hopefully at the March GSM. 4-8:30 pm UTC: Pre-Meetings. This is your chance to get groups of players together to plan stuff out, and report it to the staff at the GSM if you want. This opportunity is great for metropolitan planning organizations (MPOs), airline alliances, city governments, or other groups to meet, plan, and discuss relevant issues. Please be considerate of other players’ commitments and keep meetings brief. We won’t be enforcing a strict time limit, but we are recommending 1 hour for MPOs, 30 minutes for transit alliances (airline, rail, etc), and 15 minutes for other meetings. All pre-meetings must end by 8:30 pm UTC. 8:30 pm UTC: Promotion requests for Senator and Governor close – the earlier you apply, the better! 8:45-9 pm UTC: Pre-Meeting Reports. If you want to give a report on what happened in your pre-meeting to the staff, this is your chance! Some pre-meeting decisions may affect private GSM discussion – especially rail and road planning – so we encourage all pre-meetings to give a report. If you want to give a report from a pre-meeting, please let the admins know by 8:30 pm UTC so that we don’t forget you! 9-10:30 pm UTC: Private General Staff Meeting – note it is extended by a half hour. 10:30 pm UTC: Public General Staff Meeting. This goes on as long as necessary, concluding with the open floor discussion and questions period. We hope this agenda will work better for everyone. Though it’s not related to the GSM, just a heads-up that the Eastern line construction is starting tomorrow (January 26) on the central section, and today (January 25) on the northern section. Robin and I will be getting the stations and track installed over the next few weeks. That’s all for now. See you around! As you all know, the Mumble server is password protected to ensure that only Minecart Rapid Transit members are using it. Staffers will give out the password to members at any time if they request it. After all, a significant portion of the stuff that happens on the MRT is on Mumble, and we want you to participate! However, we would like to remind you that members should NOT be giving the Mumble password to each other – or guests! If you need to get the current server password, ask a mod or admin. Due to recent events we have been changing the password frequently, so the password you have may not be the current one. To ensure a smooth experience, you need to register your device upon connection, by right-clicking (or tapping on) your name and clicking “Self-Register” or “Authenticate” (depending on your client). This will allow you to connect to the server even if the password changes later. UPDATE: Recording for the public portion is now available here. In addition, one city was promoted further to the Governor rank. Congratulations to _frozen of Whitechapel, A11! Unfortunately we didn’t check all of the cities that were submitted! This is because a couple of you filled out the form very close to the meeting and we didn’t officially add the cities to the agenda. In the future, please submit the form as soon as you think you’re ready! Just like member applications, we check that form every few days, and we’ll check your town at the meeting itself. Finally, we are pleased to announce a new (old?) Moderator: Omricon is re-joining the ranks of the staff. Please give him a warm welcome when you see him online. Roads are all classified as A, B or C, depending on how they are built and where they go. A-class roads are the most restrictive in how and where they can be built. While anyone can build A-class roads, we are now implementing a procedure to determine who will build these roads, and where they will go. Players who build A-class roads will be able to receive in-game money as well. The staff creates a Road Corridor (RC): a simple proposal of two cities that should be connected together by an A-class road. For example, an RC could call for a road between Whitechapel (A11) and Victorian City (P10). Members submit bids to the staff, to be looked over at a GSM. These bids must include a list of players who will be building the road, and an alignment (which should be created using Dynmap screenshots with lines drawn on top). Members may submit bids for any number of proposed RCs. At the GSM, the staff selects a bid. We will try to allow as many players as possible to participate in road construction. After the GSM, the admins and winners of the bid will write up a contract containing details of the road: the alignment, player list, timeframe, and the amount of money to be received. The road will be constructed according to the terms of the contract. When the road is complete, by default it will be owned by the server, meaning any major changes such as extensions or rerouting are not allowed. However, if the players involved or an MPO wishes to become the owner of the road, they must specify this in their bid and contract. We will provide a more detailed version of this procedure as we get closer to the next GSM. The Eastern line, and Plains line extension, have been cleared for construction. You should start to see new stations on these lines opening very soon! For now, stations on the Eastern line between C27 and P29 will be given temporary station codes starting with EC (similar to how the Zaquar Shuttle used temporary codes ZSA through ZSD). These codes will be re-assigned once the line is completed. I will be heading the construction of the north section of the line (C20-XE22 and up), and Just_robinho is heading the construction of the central section (C20-XE22 to P29). The southern section (P29 to Pearl City South) is currently on hold, but will be built soon. The next line to be cleared will be the Taiga line extension. That project will likely be headed by lalaboy67 again, and will be aligned and cleared in the next couple of months. To fix that, we will be holding a screenshot contest! The details and submission process are coming soon, so DON’T send us emails with stuff yet… I promise, we will provide details as soon as we can. Frumple likes pretty pictures, so it’s your job to take pretty pictures of just about anything cool on the MRT. We love to see pictures of cool cities, random one-off builds, or special events. Your cities are a great place to start if you’re stuck. We will be taking a number of submissions and putting them up on the website! The Heads-Up Display (HUD) must be hidden in screenshots (press F1 to show/hide it). Shaders and renders are OK. Using Connected Textures and Grass Sides on OptiFine is allowed and encouraged. Non-default texture packs are OK (but we prefer default). Resolution must be 1024×768 or higher. We will crop winning images down to an appropriate size for the website. Please don’t edit your screenshots after you’ve taken them! Some cropping or rotation (or other basic edits) are OK, but don’t add stuff in the middle of the image. Again, look for a future post for complete rules and submission instructions. Did I mention there were cash prizes??? Click the button above to fill out the City Rank Promotion Request Form. The cutoff date for your previous promotion is December 13, 2014. Hey guys! It’s GSM weekend, woohoo! One of the things we’ll be talking about at the public section of the GSM is the MRT line extension project! I’ll be presenting a few updates and ideas on how to get the ball rolling on the next MRT line, which will be the Eastern line. 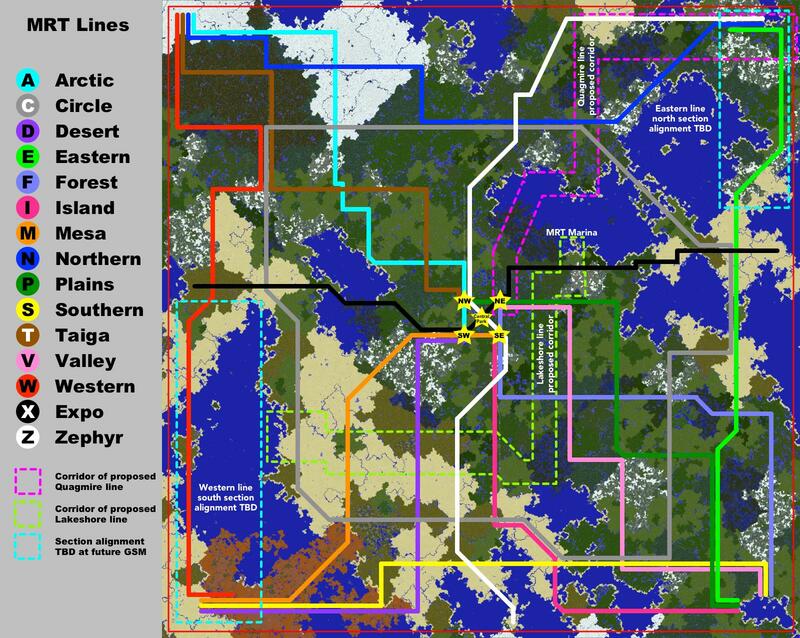 For those of you who are curious, the system will eventually look something like the map below. The dashed boxes indicate either corridors for possible future lines (which I’ve tentatively named the Lakeshore and Quagmire lines), or areas where the alignment will need to be decided at a GSM. At this meeting we will decide on the alignment for the northern section of the Eastern line. Click on the image to see an enlarged map. On Friday I will update this post with a poll, where you can vote on your preferred alignment(s) for the Eastern line in case you can’t make the GSM. Until then, have fun and stay warm! Two moderators, Music3_0 and yeamanator132, resigned from the staff yesterday. We thank them both for their numerous contributions to the server and its community over the time that they’ve been on board. If you have questions or concerns about this, please email the admins at admin [at] minecartrapidtransit.net. In other news, our next General Staff Meeting is coming up quickly! It will be held on Saturday, January 10, 2015 at the usual time of 10pm UTC. Please be sure to get your requests for Senator or Governor in as soon as you’re ready, so that we can review your town at the meeting. The cutoff date for your most recent promotion is Saturday, December 13, so cities promoted up at the December GSM are not eligible for promotion this time around. If you think you’re ready, click this button here. Finally, the old mod [at] minecartrapidtransit.net email address has been disconnected. To contact all of the staff at once, send an email to the new staff [at] minecartrapidtransit.net address.